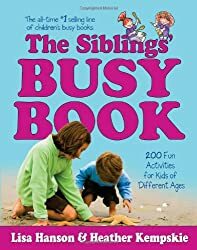 I love the The Siblings’ Busy Book , written by Lisa Hanson and Healther Kempskie. Here is the unique and great thing about this book. For each activity in this book, they share ideas for doing the activity with baby age, toddler age, preschooler age, and school-age children. Each activity has ideas for making it appropriate for these various activities. For that reason, it makes it a great book for mothers of more than one child. But it also means it is great even for mothers of just one child because the ideas will grow with your children! This book is most defintely worth getting. In case you don’t know what a “busy book” is, it is a book that lists activities to do with your children. There are art projects, games, things to do on rainy days, pretend play, music activities, movement activities, outdoor activities, family activities, kitchen activities, and seasonal/holiday activities. I have a three year old and a 15 month old. Would you suggest buying this book AND the toddler and preschooler ones or just this one?Thanks. Val, I currently have the Toddler Busy Book. I'm curious though. Do you think it's worth it to own the Preschool Busy book too? or the Sibling Busy book too? Are the toddler activities repeated in the other books, are they the same/similar activities but advanced to meet the great developemental abilities? Are the activities in the PBB or the SBB similar to what we see on all the activity blogs there are nowadays?Thanks!! Mandgmom,I have all three and I am glad I do.But if you wanted to do stuff with both kids and wanted just one book, I would do siblings.